Who does not desire a perfect, catalogue-like kitchen? Beautiful yet functional, where preparing your meal becomes a pure pleasure. Kitchen, which is the heart of your home. How interior like this can be made? Which colours and materials should be chosen, where is the place of each cabinet and what should it contain? 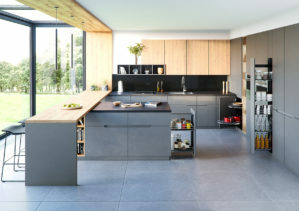 Here you can find inspiration and practical tips, which will help you create a perfect kitchen. 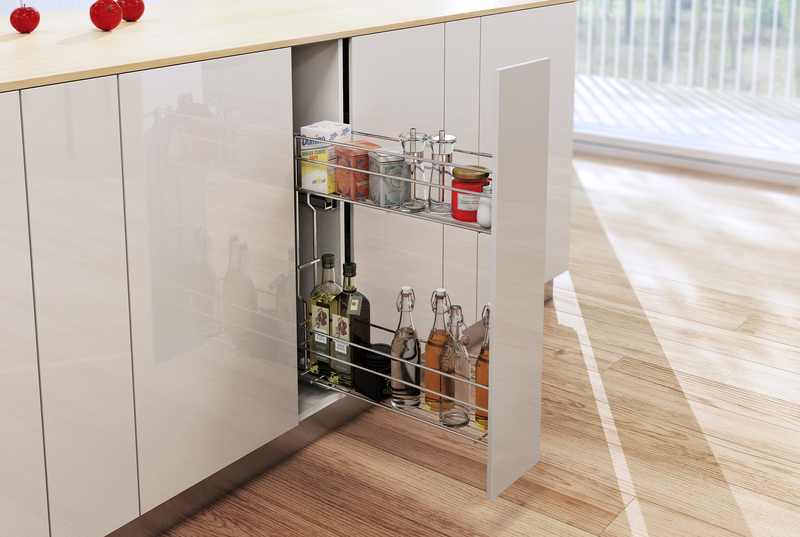 It is something more than just collection of 12 solutions for managing kitchen cabinets interior – both high, corner and base units. They are also reliable mechanisms, which guarantee 35 years of failure-free, comfortable work. Quality of execution, solutions functionality – of pull-outs and drawers, makes Maxima Evo Line great choice for your kitchen. Two, independently moving Corner Optima shelves, thanks to exceptional crafting, allows to achieve top notch space utilization in corner cabinets. 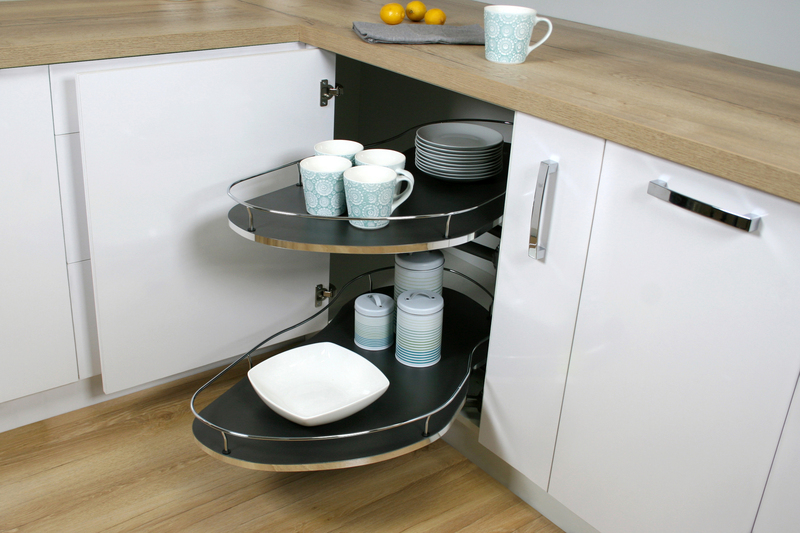 They are ideal to store large dishes, pots and pans. Fluent wavy motion and railing profiles that keep products safe from falling, guarantee second to none experience and daily comfort. Thanks to modern accessories – pull-outs and drawer units, arrangement of functional, custom-made kitchen is a task finished with ease. Offered solutions are remarkable help in everyday activities. With mentioned units keeping tidiness and preparing meals becomes sheer pleasure. 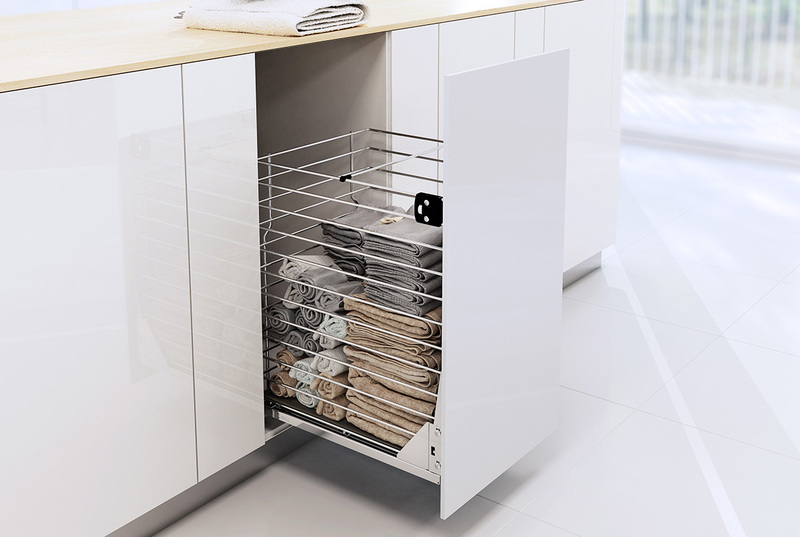 Lateral Mini Pull-out from Variant MULTI line is dedicated for cabinets with 15-20 cm doors width. 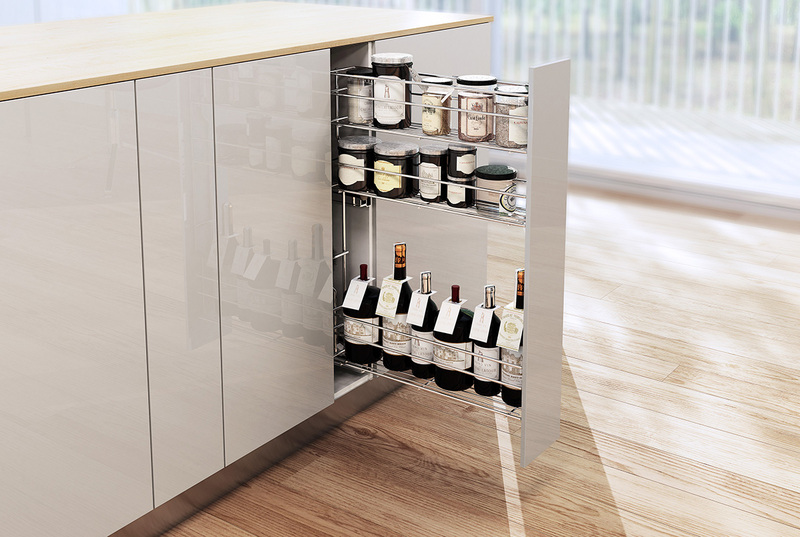 It ensures easy access to products stored even in the deepest part of a cabinet. Setting and maintaining the order of sauces, juices and spices with two-level Lateral Mini Pull-out from Maxima line is easy as pie. Just one move is enough to keep all the bottles within reach. 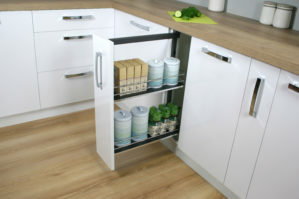 Plastic bottom of Lateral Mini Pull-out from Maxima Evo line helps significantly with maintenance of the base cabinet. 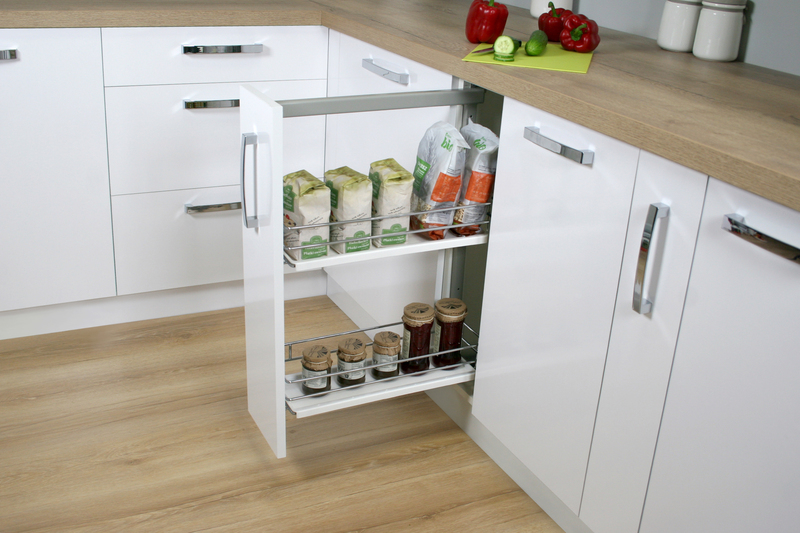 User can choose height of baskets to meet individual requirements. allows e.g. to install additional shelf and dividers for internal organization. Thanks to this fact user can adjust product to his/her needs. 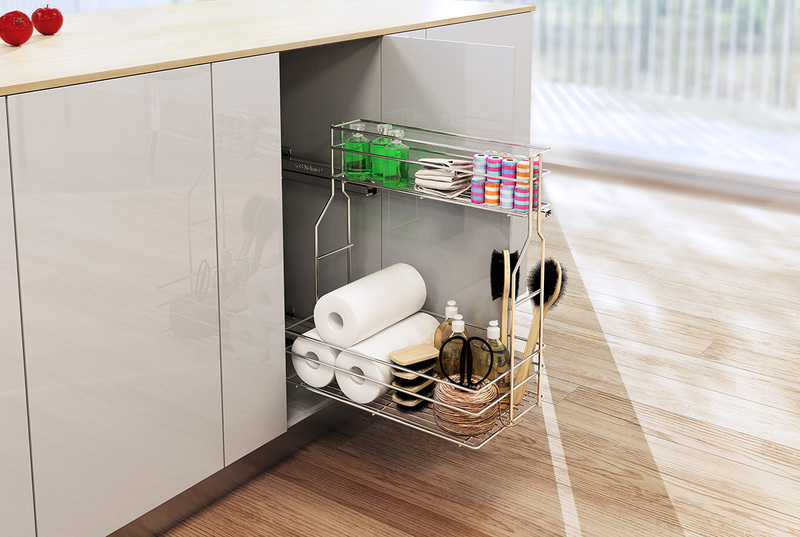 allows to arrange cabinet optimally, alongside with articles made for maintaining cleanliness. Besides – it is excellent utilization of usually troublesome narrow cabinet. Storing spices and small jars is very inconvenient. 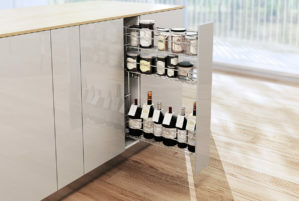 Finding one small product, especially when it is hidden deep inside of the cabinet becomes an effort. This is not a problem with Lateral Mini Pull-out for spices from Variant MULTI line, recommended for narrow 15 cm. cabinets. Additional shelf increase storage capacity and comes as an option. 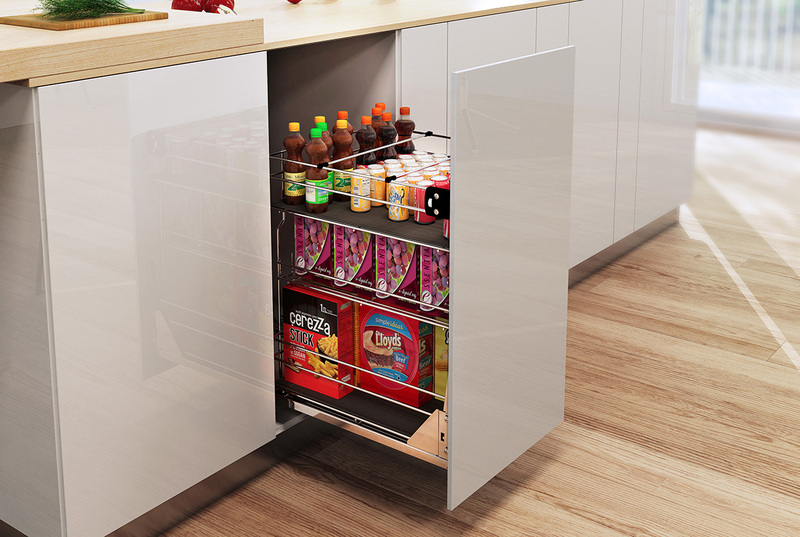 allows to maximize efficiency even in narrow cabinet. Thanks to proper bending of frame it is suitable to store dish cloths, which are usually not one of the best kitchen decorations. 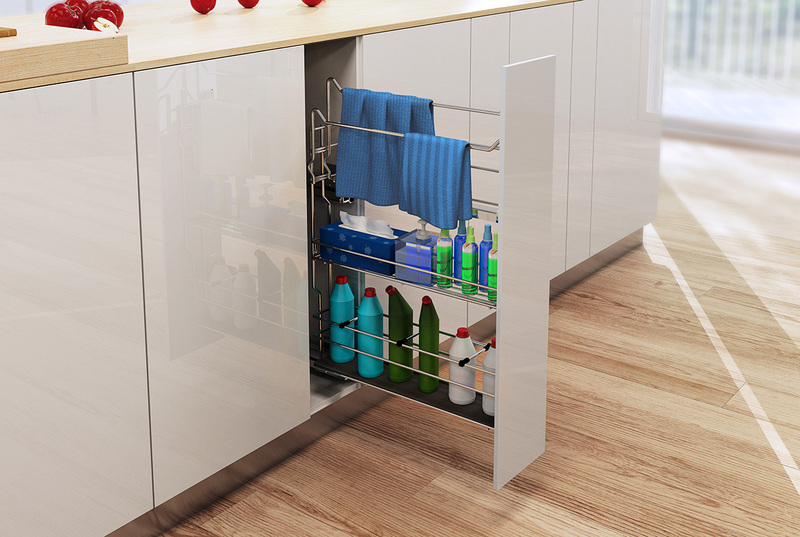 Keeping designed order in cabinet with detergents is always a challenge. While browsing to find a proper cleaning agent, bottles tend to fall over, and small accessories are usually misplaced. Lateral Mini detergents Pull-out with an option to install additional shelf for tiny containers will help you forget about this problem. Every inch of storage area in kitchen is precious. Bottom-mounted Mini Pull-out from Variant MULTI line allows to utilize cabinet space completely. Two or three levels and internal organization system, guarantee expected order and easy access to all products. 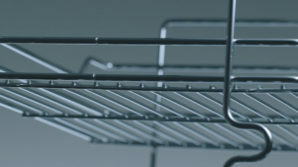 Storing towels or bed sheets in standard baskets or shelfs often compromise proper ventilation. Made of wire Bottom-mounted Mini Pull-out for laundry from Variant MULTI line ensure that issue of unpleasant smell will disappear and leave freshness instead.